Yesterday's suicide attack that killed 56 people in Charsadda, a village northeast of Peshawar, Pakistan, was not aimed just at Aftab Ahmad Sherpao, the former Interior Minister. It was part of a strategy by the Pakistani Taliban, supported by al-Qaida, to surround Peshawar with a ring of destabilization. At the time of the attack, Sherpao, a native of Charsadda, was praying in the mosque on the occasion of 'Id al-Adha (known in South Asia as 'Id-i Qurban), which commemorates the sacrifice of Abraham's son. In the Torah the son is Isaac; in the Qur'an it is Isma'il. Jews commemorate their account of this event on Yom Kippur: the substitution of a ram for Isaac in the sacrifice prefigures the scapegoat, released into the wilderness by the High Priest to atone for the sins of the people. Ppl being trained for Charsadda. Will be taken over just before or after Id al-Adha (end of hajj). Cmdr is Sher Khan. Currently training his men in Chapari area of Momand Agency adjacent to Char Sadda district. If a five-day visit to Islamabad enabled me to learn that an attack on Charsadda was being planned for 'Id, I wonder how many other people knew it. I wasn't even trying to find out about security threats. Somebody just told me in the course of a wide-ranging conversation. I can't say who, but it is not somebody that the government does not know how to find. Police intercepted weapons being sent to Fazlullah more than once, and every time military intervened to rescue weapons and people. Over last two years. Running radio for 2 years, stockpiling wpns in Paivand near Nehagh Dara connecting Swat and Dir. Camp run by two Arabs, Syrian and Iraqi. 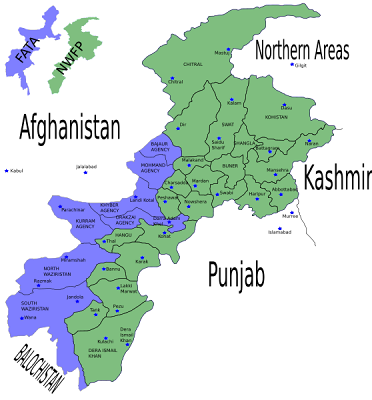 Encircled Peshawar. Captured Darra Adam Khel [eastern part of Orakzai Agency, which cuts off Peshawar district's southern access to the rest of NWFP]. Advancing on Peshawar from Matani from Darra [Adam Khel] side from south. From Bara in the West [a sub-region of Khyber agency]. Mohmand population in the northwest. While I have not conducted a systematic search, I have not come across any discussion in the U.S. media of the Taliban offensive to destabilize the areas around Peshawar, which is adjacent to Northern Punjab and the capital, Islamabad. The bombing is depicted as an act of terrorism aimed against an individual, rather than as part of a political and military strategy by a coherent political group. Just last week, however (on December 14), in an interview with BBC Urdu service, Baitullah Mahsud, the commander of South Waziristan, reported that the Pakistani Taliban had agreed to a single chain of command under him. This apparent U.S. inattention to this major development has of course given rise to conspiracy theories in Pakistan: that the U.S. wants the Taliban to surround Islamabad so that it has an excuse to destroy Pakistan's nuclear weapons.... Of course this is completely ridiculous (please do not circulate this theory on the internet and attribute it to me), but the weak reaction to the Pakistani threat by President Musharraf, who clearly considers the Supreme Court and the Bar Association to be greater dangers to his power, and the continued support for Musharraf by Washington, generate such theories as Pakistanis struggle to make sense out of the slow-moving and quite visible catastrophe that is gathering in their country. The New York Times has it right today: Musharraf is weakening Pakistan. People get pissed at small inaccuracies in comment - and it deflects the impact of the message. Eid al Adha, doesn't exactly mark the end of hajj, I am pretty sure. Yes it marks the sacrifice asked of Abraham, and its commencement coincides with the third day of the Hajj. which is not the last day. All of this is important theologically and pretty important in this forum to be...correct. Not simplified to fit into a brief mesaage, correct. The Hajj, to westerners is the be all and end all of Islam as a ritual. It's a duty, once in a life time, for able bodied and so on....best to remember that Islam is possibly the most accommodating of religions for even the orthodoxy being excused for inability to fulfill these kinds of requirements. The 'grand' Eid, is an every year occurrence, it is independent of the hajj. It marks all kinds of tings that are theologically important to Islam. Submission to the will of the divine, the meaning of the word Islam. The parable and symbolism of Abraham and the annunciation from Gabriel - all key elements of Islam. Although Eid al-adha is a time of giving, charity and hopsitality - it is not reported to be so in the western press. Pity. Let's forgoe the stereotype here, let's honor the more important holiday above the trip to Lourdes. "Mr. Musharraf seized power in a 1999 coup, so his rule lacks legitimacy no matter how he manipulates the country’s legal underpinnings. But instead of trying to strengthen Pakistan’s institutions, he is continuing to undermine them for his own power and profit. Meanwhile, Pakistan’s citizens leave no doubt that they’re sick of the former general." Substitute Bush for Musharraf and Americans can relate, but on the other hand the US is in no position to give advice, is it. Mushi isn't stupid. He knows that. And he knows that the NYT would never write about Bush that way, even though the two don't differ in outlook much, although their tactics differ. Pakistan has problems in the far-off NWT and the US has riots in New Orleans and they are not of much interest to either president when their main interests are power and profit. A number wow gold of steps wow goldhave been taken buy wow gold to address Character buy wow gold Re-Customization cheap wow gold issues, and cheap wow goldwe believe that wow power levelingmany wow power leveling players previously power leveling unable to power levelingcustomize their wow gold character should buy wow goldbe able to do cheap wow goldso at this time.